The Pittsburgh Coal Company desired a way to ship coal from their coal mines along the Monongahela River to the Republic Steel Company in Youngstown, Ohio without having to use existing carriers, such as the Pennsylvania Railroad (PRR) or the Pittsburgh & Lake Erie Railroad (P&LE). The coal company’s plan was to ship coal from the mines via the Monongahela and Ohio rivers to Smith’s Ferry, Pennsylvania, where it would then be transported by rail to Youngstown. The coal company, however, was refused permission to build a railroad from Smith’s Ferry and Mill Rock in 1928. 4 The Interstate Commerce Commission stated that the present lines operating into Youngstown by the PRR were more than adequate to handle the proposed traffic of the branch. In response, the coal company acquired the Pittsburgh, Lisbon & Western Railroad (PL&W), which operated between Lisbon, Ohio and New Galilee, Pennsylvania, and the Youngstown & Western Railroad, which operated between Columbiana and Youngstown. To avoid having to use the PRR to reach Youngstown, Pittsburgh Coal desired to construct a $3 million 5 branch line along Beaver Creek from Negley south to Smith’s Ferry. 4 It would include a tunnel at Grimms Bridge. In preparing for construction, the Y&S sought permission from the township to abandon a 963-foot section of roadway so that the railroad could construct their branch. 5 In return, the railroad would construct a new roadway for the township. The Cleveland & Pittsburgh Railroad (C&P), a PRR subsidiary, pleaded with the Beaver, Pennsylvania common pleas court to stop construction deny the railroad permission to construct the new roadway. The C&P claimed that maintenance of the new highway would be cost prohibitive for the township. 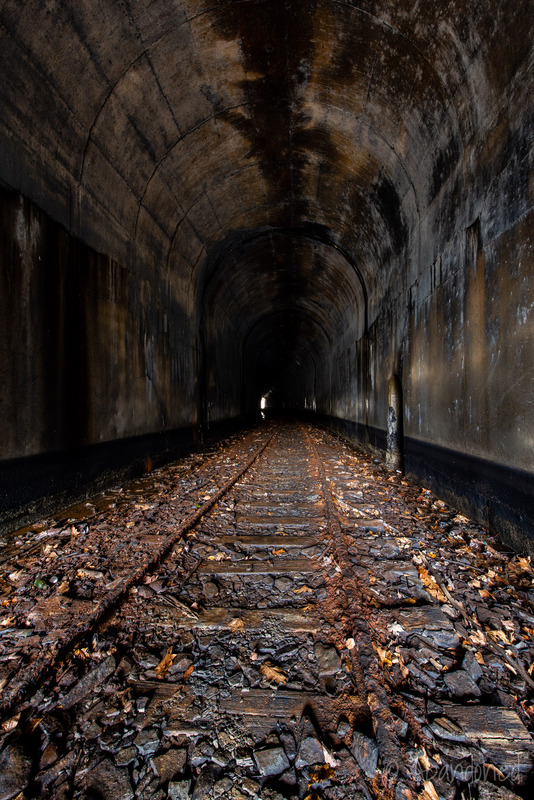 The route included the boring of a 1,200-foot tunnel at Grimms Bridge in order to avoid a Pennsylvania railway right-of-way. 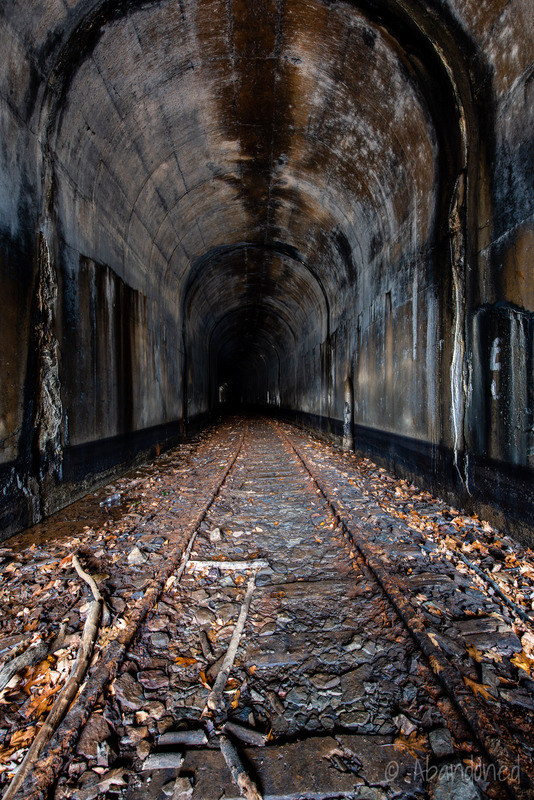 6 The concrete-lined tunnel was built by the Booth & Glinn Company of Pittsburgh. It also included a railroad trestle over Beeler’s Run near Fredericktown that was erected by the McClintock-Marshall Contracting Company of Pittsburgh. The PRR and the Pittsburgh & Lake Erie (P&LE) railroads sought to halt operations of the Y&S in shortly after Smith’s Ferry Branch opened. 4 The railroads claimed that the Y&S was built without proper authority and without approval of the Interstate Commerce Commission. The northern Ohio federal court and the sixth circuit court of appeals had previously refused to stop construction and operation of the Y&S. The PRR also sought to interfere with the Smith’s Ferry Branch’s coal docks at Smith’s Ferry. 4 The PRR claimed that the dredging of the canal bed on Beaver Creek, used to access the coal docks, would endanger their bridge across Beaver Creek. The courts had previously came into agreement with the Pittsburgh Coal Company. 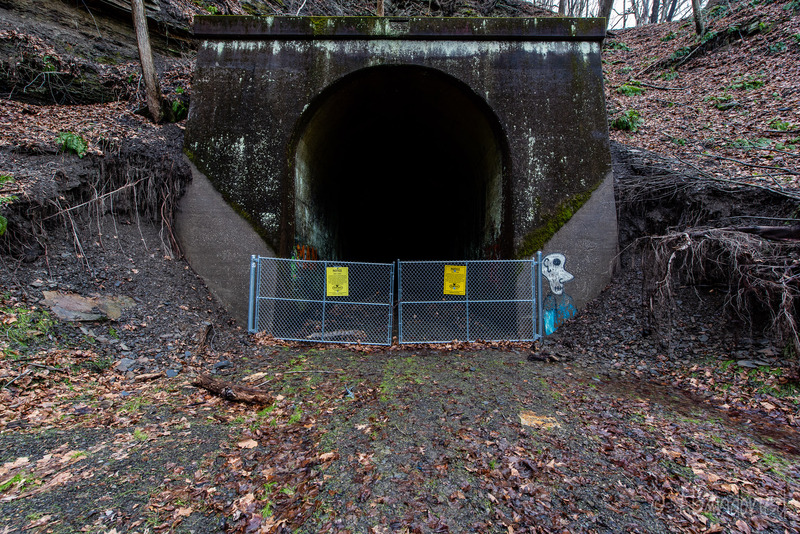 Active service continued on the Smith’s Ferry Branch until 1967 when a landslide filled the south portal of the Grimms Bridge Tunnel. 2 The landslide originated from a strip mine that had been operated by the Tassi Coal Company, which had gone bankrupt. Due to the precarious finances of the PRR and NYC at the time, the tunnel remained covered. Trains were simply rerouted to other PRR and NYC routes. In 1970, the PRR declared bankruptcy. The newly independent and profitable P&LE gained control of Montour and Y&S. The Y&S sought federal permission to abandon all but the northernmost mile of the Smith’s Ferry Branch on April 26, 1977. 1 The motion was not granted. CSX acquired the P&LE in 1991 and the Y&S was leased to the newly formed Pittsburgh, Lisbon & West Railroad (PL&W). 7 PL&W filed to abandon 12 miles of the Smith’s Ferry Branch in 1995. All but the northernmost mile 9 at Negley was removed in 1996. A group of local enthusiasts formed the Sandy-Beaver Canal and Railroad Company in April 1970, with the goal to carry passengers along a steam-powered locomotive between Negley and Smith’s Ferry. 2 Two steam locomotives, a car and a caboose were obtained. The locomotives were sourced from the Carbon Limestone Company of Lowellville. One was a 71-ton six-wheel built by the H.K. Porter Company and the other was a 45-ton four-wheel built by the Vulcan Company, both unused since the 1950’s. In 1991, the Little Beaver Creek Valley Railroad (LBCV) was organized with the goal of organizing a tourist train along the Smith’s Ferry Branch. 7 The LBCV paid the PL&W $250,000 for the right to operate a train over the branch on a two-year lease with an option to purchase. 8 Operations were transferred on May 1, 1993. “Spring Operation Seek as Goal of Tourist Railroad.” Evening Review [East Liverpool], 25 Feb. 1971, p. 7. “Montour Wins Beaver Court Row.” Evening Review [East Liverpool], 14 Oct. 1932, p. 1. Muller, Christopher. “Grimms Bridge Tunnel (1933-1965).” Steamphotos.com, article. McKay, Jim. “Rail people.” Pittsburgh Post-Gazette, 30 May 1993, pp. B15, B16. “Pennsylvania Railroad – Pittsburgh Area.” Rails and Trails, article. Beaver County Greenways and Trails Plan. Pittsburgh, Pashek Associates. I had been wondering about the history of this RR since 1975 when I used to hike the rails from Fredericktown to the trestle over Bieler Run. I can’t thank you enough for this outline of the history of the Smith’s Ferry Branch.